Owls have been very collectible for the past couple of years. They are fascinating creatures and here at 3 Winks, we love all of the cute renditions of owls out in the market place. We also know a number of other people who are owl lovers and we thought we would put together a gift guide for the owl lovers out there in your life. This guide could also overlap as a gift guide for women, a gift guide for the Harry Potter Lover, and a gift guide for the difficult to buy for. Or, a gift guide for me because I love everything on this list! I loved this owl necklace with a Harry Potter theme from the moment I saw it! I would love to get one for each of us here on the blog. Literary Emporium has a lot of other options to fall in love with. If you are in an ornament exchange and you know you have the owl lover as your recipient, look at this little owl ornament! Who wouldn't love that? You can find it at GrannyKstreasures. This Owl Embossed Leather Journal Is so beautiful! The pages are nice enough for watercolors. It is a great buy, too! Here is another Harry Potter themed item. They are Hedwig and Pigwidgeon as salt and pepper shakers! They are magnetic so their wings stick together! This gift would also satisfy the salt and pepper collectors out there. If they collect salt and pepper shakers and owls, plus love Harry potter, you are really in luck because these would be the perfect gift to cover all of the bases! Target has a bunch of owl themed items. Here is the page to check them out. My favorite is this owl print towel. It is adorable! 6. Look at this adorable owl print from Minted! It is available in many sizes and in many frames. 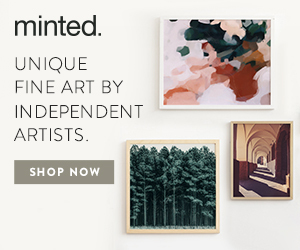 Plus, right now you can get free shipping on non-custom art with the code: FREESHIP! I love free shipping! And, I love this little owl. Wouldn't he be cute in a library or nursery? 8. If you only want to add a touch of owl to your gift, Dollar Tree is the place to shop. You can find owl themed stickers and pencil sharpeners. They are super cute, too! 9. Here is an adorable board book for your grandchildren! The thoughts are so sweet, listen to these words: "When I made my wish upon the Grandma Star, I made my wish for you. When I first held you in my arms, my Grandma Wish came true." It is called Grandma Wishes, by Julia Lobo and the beautiful illustrations are by Helen Rowe. 10. Don't forget that owl lovers will most certainly love receiving an owl calendar for next year. There are many beautiful ones to choose from. Here are just a few of the choices. So, there you have it! My top choices for owl gifts this year! I am certain that any of them would not disappoint the true owl lover! As you know, from past posts, I am one happy grandma! Grandbabies #8 & #9 are on their way this year. Lindsey and Alicia are both having girls! That will help even up our count right now of 5 boys and 2 girls. Alicia is due in September. Her first little baby boy was delivered at 32 weeks and had to spend some time in the NICU. We are hoping that she makes it all of the way to September with this baby girl. Since Alicia lives in California, and not far away from most of my side of the family, I am thinking a shower with family may be in order to welcome the new baby. Planning a shower from long distance can be tricky, but Beau-coup is a great place to start finding what I need to throw a great baby shower! All of my photos and colored links are clickable and will take to you to the site where you can order them or shop the site for any of your party needs. Owl Party Supplies: When I saw the adorable owl themed items that Beau-coup has to offer, I knew it was the theme I had to use! To begin with, they have this adorable complete Party Kit that has almost everything you need to get the party started! I think the menu/place cards, would be great to label the foods on the table, or to label other games or items throughout the party! If you want something other than an owl theme, this kit also comes in 14 other themes! They are all adorable! Since the kit comes with Cupcake Wrappers/Toppers, I thought a small owl shaped cake, like the one I did in a past post, surrounded by cupcakes. Of course, I would change the colors to match the baby shower theme! Anyway, cake and food means that we need plates! I didn't find specific owl plates on Beau-coup, but I did find some adorable plates that I think would be terrific for our theme. These marbleized pink plates are so pretty! For cups, I will probably use a simple clear plastic with a pretty pink punch to add color to the day. I may use the stickers from the kit to decorate the cups or plates. I haven't decided. Owl Shower Invitations: Beau-coup does offer a fill-in invitation for Baby Showers. It has a cute little owl on the top of it. Or, I could use these labels to fit the theme. I could purchase plain white or pink note cards and make my own invitations with these printable labels. These labels are customize-able to different colors, shapes and sizes. They also come in many other themes. Also, these labels would have so many other applications for the shower, such as labeling favors or gifts. The kit up above also comes with stickers, so you could use those, these, or both! You can never have enough stickers! Owl Themed Party Favors: A shower is always better when there are favors for the guests to take home. I love little boxes filled with candies or some other little gift. Look at these! These are adorable, right? They have plenty of room for some Hershey Kisses! I fell for these little candles! They could be used as prizes if we play games! Owl Themed Game: A lot of people don't like shower games. I don't mind them because I have a game playing, competitive nature. So does my family, so since this is a family party, games are a must! I recently attended a baby shower that played a similar game to this and everyone love it because It was played as you watched the mama open her gifts, which made that part of the shower a lot more fun for everyone, instead of just the usual oohs and ahhs! Beau-coup has made it into an Owl Bingo Game. Owl Themed Gifts: We have all seen cute gifts made out of diapers, so believe it or not, I have even seen owls made out of diapers, with an owl bib on the front as well. There are so many cute things, that as the host and the grandma I could give to Alicia that would also add to the Owl theme of the shower. There is one adorable thing on Beau-coup's site that I think would be a great gift and centerpiece! And since Alicia lives in the cooler climate of northern California, this would be perfect for her baby! Take a look! What an adorable Owl Blanket! They also have other animals available. With Beau-coup's help, I think that this Owl themed Party should come together nicely! Now all I have to do is let my sister know that we are having a party at her house! (I am sure she will be thrilled!) I will let you know how it goes! In the meantime, if you have any other great Owl party ideas, please let me know! It is amazing how many people love owls. Back in September, I wrote an Ode to Owls that was very popular. You can check it out here. Because so many people have begun to recognize that our brand, 3 Winks Design, has owls in the logo, I have been receiving some little thoughtful gifts of owls in various forms! I love it! I thought I would share a few with you, and I realized that I haven't shared the recipe for the owl cookies yet! So, I will include that today as well. They are super tasty and fun! First, here are the new things that I have been gifted for my collection! I will try to show you where you can find similar items, but some of mine are pretty unique! Click on these pictures to find out more about them. At a recent family gathering, my sister-in-law brought me this ceramic dish/planter with owls on a log. It looks so cute on top of my bookcase! I haven't decided what to put in it, but for now I'm just enjoying it the way it is. Thanks, Ada! My friend, (and Lindsey's mother-in-law), Joanne, sent me this adorable mug! The owls are so similar to the ones I draw and our logo owls that Maddy drew. They are perfect for our brand! It is too hot for a Hot Cocoa Bomb right now, but as soon as possible, I will be making some in it! For now, cold milk will have to do. Thanks, Joanne! You are so thoughtful! My friend, Leslie, gave me this Vintage Owl Pin from Avon. It was a sweet surprise! It had emerald colored eyes. I love the cool, retro vibe! It used to be filled with a cream perfume. Leslie thought I might use it like a locket! I love that idea. Thanks, Leslie! Here are a few similar things I've found if you are interested in owls like these for your own collection or as a gift to an owl lover that you know. Just click on the picture to order. This owl necklace isn't a locket, but look how cool it is! It glows in the dark. I can think of a few people who would love this! And, below it is an owl locket with a very similar in look to my pin above. The owls on these mugs also remind me of our logo. I couldn't resist showing you these 3 pewter owls sitting on an amethyst base. Such a statement piece. Now! On to the cookies! round cookie cutter, about 3-4 inches in diameter. Click on the pictures in the gallery to see how to decorate them. Use a round cookie cutter or glass to cut circles from the dough. Use the edge of the cutter to mark the wing shapes, then use a knife to cross hatch the lines on the wings. Form to balls of dough to make the eyeballs. Push chocolate chips into each eyeball to make the pupils. A sliced almond forms the beak and slivered almonds form the talons of the owl. Before baking, bush the wings with dry cocoa powder to color them. Bake as the recipe directs. Soon you will have a parliament of owl cookies! These would go so well with the mug full of milk that I mentioned earlier!